Vertical gardening has arrived. Combining inspirations from landscaping, architecture, interior design and even fashion, inventive vertical plant compositions are popping up all over the world. These are our most inspiring picks, showcasing the versatility and innovativeness of this urban-friendly way of greening the space around us. Warning – it might prompt you to try out vertical gardening yourself! If you’re in doubt that vertical gardens are in fashion, this creation by Dior will surely convince you. Dior used this striking vertical design to draw attention to the Spring/Summer 2014 collection at Paris Fashion Week. Progressive architects love to incorporate plants into their projects. Milroy Perera Associates have recently designed the world’s tallest vertical garden. The design fantastically sums up the benefits of including living elements in architectural designs: “pioneering sustainable residences, with the aim of taking urban living forward while still maintaining a balance with nature and the surrounding environment”. 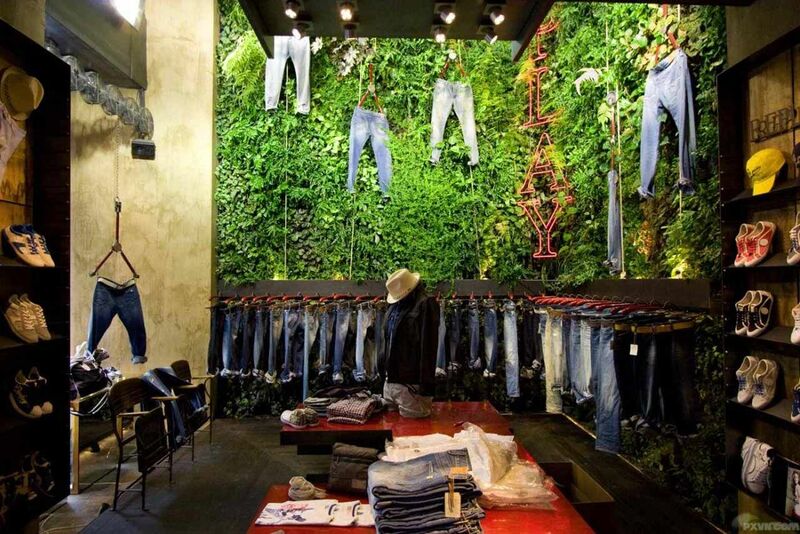 This is the proof that vertical gardening can be applied in a variety of spaces, including commercial units. Make sure you select the plants able to deal with ambient lighting and minimal care! Odd-shaped space? Not a problem! This Tokyo design takes advantage of an entrance wall to make a plain feature of the building it’s eye-catching asset. Westin Hotels & Resorts unveiled this public space concept, demonstrating how business can lead in customer care and wellbeing by incorporating living walls into their spaces. One cannot miss how skilful design results in an impressively precise, artful composition of the project. What’s underneath a garden… soil? Far from it – these Shanghai ZOO hanging gardens provide visitors with a completely different perspective on public green spaces and can be a real “sight for sore eyes” on a sunny day. How about something you could apply to your home? While this live/workspace in Linkebeek is an bursting with greenery, it shows the power of transforming domestic spaces with vertical gardening. With their health benefits as well as a calming and aesthetically pleasing properties, there are simply no downsides of getting started: do try this at home! Lately, the idea of green walls has become very fashionable. Either part of a building or free standing, this sustainable innovation is healthy and great to look at. Also known as living walls, these vertical gardens are packed with flora that benefits everything from our lungs to our ears! It has been scientifically proven that foliage can improve air quality. Indeed, the Amazon rainforest is often referred to as ‘the lungs of the world’. A green wall will help to vastly improve the quality of air in any environment. It acts as a natural air filter, purifying the polluted air whilst releasing clean oxygen. If installed in an office environment, the presence of green walls can lead to greater employee productivity and overall health, since cleaner air leads to better concentration, healthier employees and fewer sick days. No one who has seen a green wall close up can say that they’re not impressive, especially the larger-scale ones such as Patrick Blanc’s Parisian creation. We’re simply not used to seeing gardens grow upwards, so it catches our eye! Excellent for the home or the office, a green wall can turn any dull and dreary room into an inviting and alluring environment. This can be great for creating a good first impression on your clients when they visit your business. Or, if you want to give your home a nice colourful touch, it will add some green to your own four walls and be a great talking point when you have guests over. In the Western world, and America in particular, we love air conditioning. However, the costs can be astronomical. Did you know however than installing a green wall acts as a natural air conditioner, balancing humidity levels in the process to keep us comfortable. Through a process known as evapotranspiration, the air surrounding the green wall is naturally cooled. In winter, a green wall on the outside of a building acts as insulation, reducing the need for costly heating too. You might be wondering how can a bunch of plants help to reduce noise levels! It is one of the lesser-known benefits of a green wall, reducing background noise in loud, communal dining areas, or reducing noise pollution from traffic on busy main roads. The foliage absorbs and reflects the noise that comes its way, so if there’s a room in your home you want to make as peaceful and relaxing as possible, a living green wall can help – and that’s not to mention the general sense of calm and well-being that comes from being around greenery! So, How Do You Install Your Own? Green walls are great for those who don’t have much garden space. Although a professional will be needed for larger scale projects, this is still something you can attempt yourself on a smaller scale at home. Select the space you wish to use for your very own green wall. Get started by building a frame; you will need a good, solid structure which can be hung onto the wall. Plastic is generally considered the most appropriate material to use. A plastic sheet must then be attached to the frame to stop water from leaking. You are now ready to attach a layer of fabric to the frame, which will act as the foundation your plants will live and grow from. Use a material which has effective water retention properties and lets roots grow through – felt is often the material of choice here. Set up an irrigation system for the water to be able to reach all parts of the wall. The usual style is to attach a tube across the top of your wall, which will drip water down throughout the whole structure. As this is one of the most important aspects, you will most likely want to consult an expert in the field. At this point you will also need to add a fertilising system. Finally you will want to choose and insert the plants you want to include in your green wall. This is entirely down to your personal preference. Just take into account the current aesthetics of the room or garden where you are constructing your green wall. For a more in-depth guide to creating your own green wall, take a look at this article. Growing a vertical garden indoors is the same as growing plants in containers on the fire escape or indoors. Plants need the same thing, no matter how you arrange them. It’s a fairly straightforward process involving containers, a hanging system, water and soil. Growing a vertical wall garden indoors is the perfect way to get your herb garden without taking up precious kitchen space. What is A Vertical Wall Garden? A vertical garden involves a sort of container and system that lets you place the plants vertically. Most often vertical wall gardens are attached to the wall or lean against it. Any garden that meets this criterion is a vertical wall garden. It’s really that simplistic and it’s just as easy to maintain as a regular garden. The sky is the limit for vertical wall gardens as they are essentially the same as regular gardens just vertical rather than horizontal. You can grow a selection of herbs in a vertical wall garden and hang the containment system on the wall of your kitchen. You can also make a vertical wall garden of veggies by using the right materials to create a structure able to support larger vegetable plants, like tomatoes. You can also choose to plant a selection of flowering greenery, vines or even cactus. Anything of a reasonable size can be planted in a vertical garden. Just don’t expect it to hang on the wall with a large vertical garden as the weight of the soil and plants tends to make it difficult. You can make an indoor wall garden in a variety of ways. You can use recycled materials, like old gutters, or materials bought from the home improvement store. When it comes to making your own indoor vertical wall garden, there are many options and styles to create or buy. The picture frame is the simplest of the indoor vertical wall garden types. Start with an old picture frame or make your own frame. Then, attach chicken wire to the frame. Hold the wire in place with a second smaller frame—either bought or handmade. Attach the back to the second frame. Fill with soil, plant your favorites and water them. Most materials can be reworked into a vertical wall garden. For example, you could attach three rows of gutters to a solid wall in the interior of your home. Fill the gutters will soil and plant with your favorite flowers, vines or veggies for a permanent feature wall. A container system starts with a series of containers, set of brackets and a strong material, like wood. You can use a piece of plywood or other suitable material as the backing. Attach the containers to the material with nails or staples. Then, add soil and plants. Hang or rest against a wall. The only difference between an outdoor and indoor vertical wall garden is the size and weight. Because houses do not have unlimited space, so indoor vertical wall gardens tend to be smaller and less heavy. The picture frame style indoor wall garden is entirely possible, but it can get messy. Containment systems are more likely. Indoor vertical wall gardens can be messy, if the wrong materials are used. That’s way the container vertical wall method is more likely to be used then the picture frame style vertical wall style. Indoor vertical wall gardens are very easy to make and add a living piece of art to your humble abode. The endless options make for individual and fun vertical gardens for your home. What kind of plants do you want to sow into your indoor vertical garden?